Our newly renovated apartment is a Non smoking apartment on the first floor. A smoking area is available in front of the house. You can expect a cozy living room with TV and sofa and dining area, a separate fully-equipped kitchen, 1 bedroom with 2 single beds and an additional seating area. An extra bed by another extra bed is possible. The second bedroom has a single bed and a 140 bed. Upon request, a cot can be placed here. The apartment has a bathroom with bath, shower and toilet and a separate toilet with sink and washing machine. A vacuum cleaner, cleaning utensils and an initial supply of toiletries is available. Wi-Fi is available free of charge. On request, the dryer can be used in the basement. Sehr nette Begrüßung durch die Eigentümer, alles sehr sauber und die Wohnung ist groß, die Küche vollständig eingerichtet, die Betten bequem und viel Platz zum Unterbringen der mitgebrachten Sachen. Jederzeit wieder - sehr empfehlenswert. Die Ferienwohnung ist schön. Die Gastgeber sehr nett. Die Wohnung ist schön geräumig und gut ausgestattet. Im grossen Garten durften unsere Kinder spielen und planschen. Es gibt ein großes Gehege mit Hühnern, Enten und Gänse die man füttern darf. Bei der Fütterung der Forellen durften die Jungs auch mithelfen. Zudem gibt es ein großes Gemüsebeet, bei dem man sich bedienen darf. Die Lage ist ruhig, im nächsten Ort gibt es Bäcker, Metzger und 2 Supermärkte. Der ganzen Familie hat es sehr gut gefallen. Wir würden die Wohnung weiter empfehlen. 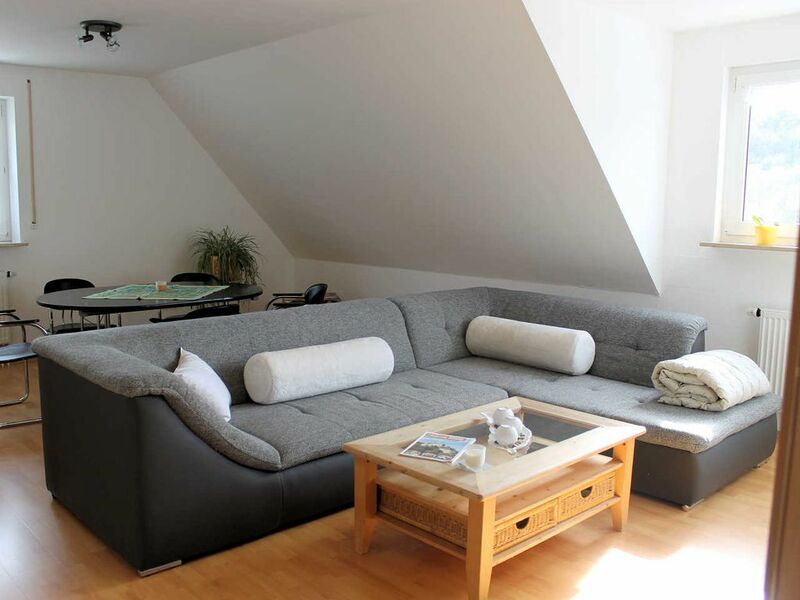 Our apartment is located in a quiet location in people Bach. There is a bus service in town, as well as a train connection in the neighboring village. Get active: We have beautiful trails for Nordic walking, hiking and cycling. Climbers and mountain bikers will also get their money's worth in our region. But you might also want to join the summer toboggan run or a cave tour? Franconian Switzerland also has a lot to offer culturally and culinary. After all, the region is also known as the land of castles, caves and delights. Travel through the Wiesent Valley with our nostalgic trains, experience a historic city tour through Forchheim or a beer cellar tour in the Forchheimer Kellerwald. Enjoy the good Franconian cuisine in the many quaint taverns, rounded off by a cool beer and a fine drop, which is made in the many schnapps distillers in the area.